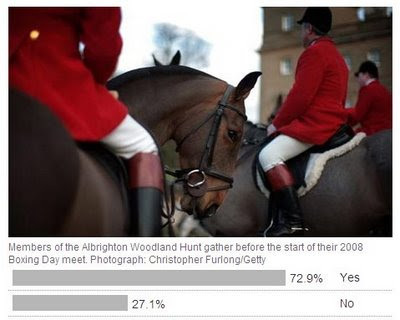 Rabbit Stew: Guardian Readers Repeal Fox Hunting Bill! Yep, it's official: Guardian readers (of which I, not without some grumbling, mind, am one) have decided that the Fox Hunting Bill should be repealed. This seems to make some sense to me. Possibly the only way the UK will ever make any money again is by setting up a score of Brideshead Revisited/Fox Hunting theme parks so that the folk from countries who still have some sort of manufacturing economy can come and toss us a few pennies as we all parade around in faux-Victorian costumes declaiming about the 127 wives of Henry the Eighteenth. Though, while they're at it, since we'll all be foraging for food between stints in costume, it would make more sense if it was not utterly, death-penalty illegal - as it is at the moment - for us commoners to use much beyond harsh language on the wild game in the fields - so let's loosen some of the legislation on air guns a tad while we're at it, shall we? Or repeal the Act of Enclosures and give us back the land? Whatever - just sort it out, will you?